I’ve had this idea for an inkle band project for a while now. Since December, actually. In between playdates, laundry, runny noses… you get the picture, it’s been thought about, drawn, theorized about, and sampled- 3 times. Finally, I came up with a method that would give me the results I wanted. The best way I found to inkle with beads was to pre-string the warp with beads. I used 1,020 cube Delica seed beads. When warping the loom, I only put the beads on the unheddled open warp threads. 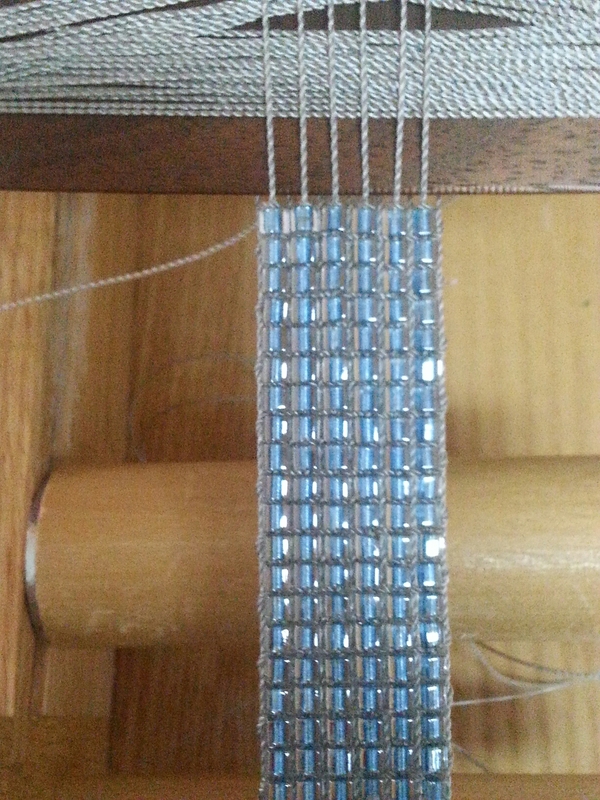 Then, as I weave I slide beads down as needed. The project that is to come is really exciting, if I may say so myself, unbiasedly of course. More details will be revealed soon. I’m trying to finish it in time to attend my state guild weaving conference, FTWG, in mid-March. Wish me luck! Trying to figure out what you did…are those bugle beads? I’m sorry. I totally forgot to put that in! I updated the post. They are cube Delicas. It feels amazing. I love Delicas. Their sizes are so uniform you can use them almost without thinking about them. Wow! How elegant. I’ve seen bead weaving where the beads are on the weft, but not on the warp as you’ve done it. This is very beautiful! Thank you, Julia. It turned out as I had hoped, but better! It’s of the loom and waiting to be finished! Thank you! Can’t wait to finish the project that it is for. Beautiful! Looking forward to seeing the finished product!